When is it useful to draw the eye in detail? In most situations, the general shadow-shape of the eye is almost all that you need when drawing a horse. 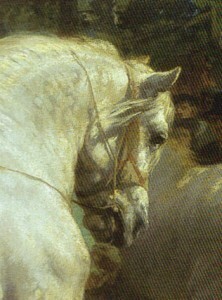 For advice for artists on the shape and position of the horse’s eyes, click here. 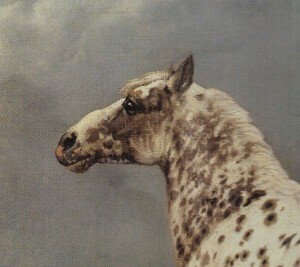 If you are commissioned to draw a portrait of a horse’s head, you will probably be expected to draw or paint the eyes in loving detail. The shape of the lids, the colour of the eyes and lashes and the expression within the eyes all help in achieving a “likeness”. 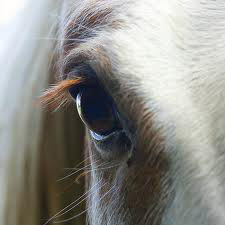 While horses may communicate with one another more with their ears and general body language, it is the eyes that have an emotional “hold” over us humans, so it is as well to get good at drawing them. 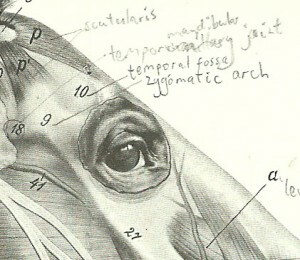 In this post, I explain the structure of the horse eye as seen close up. 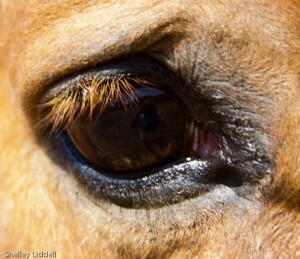 In the next post I shall discuss equine eyes, mood and expression. 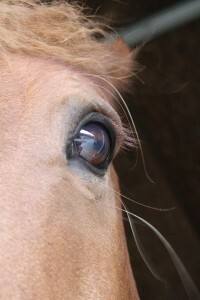 The dark central pupil is round in foals but becomes horizontal and rather oblong as the horse matures. The iris fills most of the visible eye and is usually brown. 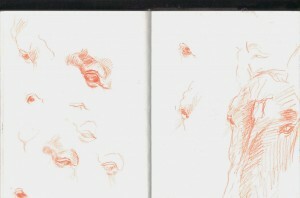 If drawing in preparation for a close-up portrait, pay attention to its exact colour and make good sketchbook notes e.g. dark chocolate brown or hazel brown. 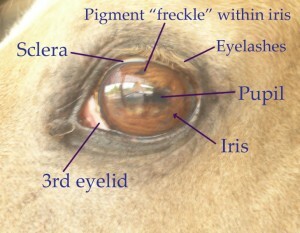 There may be beautiful freckles of darker pigment within the iris, as here. Notice also how the iris is a richer, darker colour around its edge. 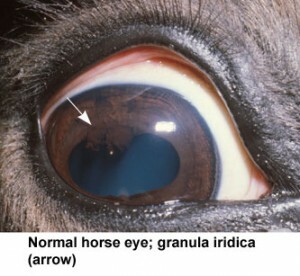 The sclera is the white of the eye and may be just visible, in some horses, as a rim of white around the iris. The upper eyelashes are very prominent. Notice their length and colour when drawing a portrait. The third eyelid is a whitish membrane that may be just visible at the inner corner of the eye. Note, also, the tiny bit of glistening pink “mucosa” membrane that may also be visible within the inner corner of the eye. 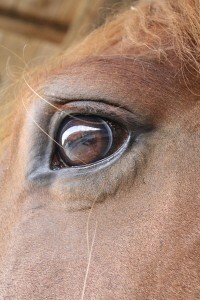 In my experience, the upper and lower eyelids themselves do not vary much in shape from horse to horse. 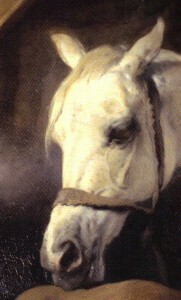 However, do pay attention to any colours that you see when drawing a portrait as this will mean a lot to the horse’s owner. 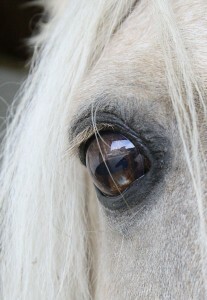 For example, some light grey (almost white) or palomino horses have dark grey upper and/or lower eyelids. 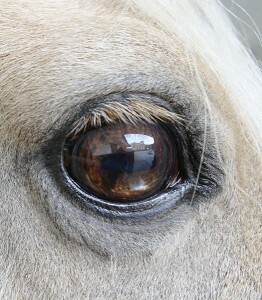 In looking at your horse’s eyes close up, you may some brownish shapes over the top edge of the pupil (see below). These are called either corpora nigra or granula iridica and are usually just normal pigment. In the photo below, someone is lifting the upper eyelid for a better look at the eye, which is why we are seeing so much of the white sclera at the top. See how the upper eyelid protrudes and curves over the eye. Notice also how the eyelid has an appreciable thickness. Its free edge is rather rounded and does not appear sharply sheared-off. The graduated highlight on the upper lid helps to describe its shape. The diagram above also shows how the eye is set under the prominent “eyebrow”. In this case, the brow is formed of muscle in the shape of an upside-down “U”. Horse eyebrows change shape with expression and sometimes look far more pointy than this. Notice how the three-dimensional roundness and structure of the brow is clearly shown here using tonal shadows and higlights. The eye surface curves like the surface of a ball or sphere. Notice how much (or little) of the eye is visible from the front view, as part of the “eyebrow” curves in front of it. If you insist on working from a close-up photo, be aware that the photographer and camera may be visible in the photo as a mirror image in the eye. Do not work from a flash photo of the eye. The flash will completely alter the appearance of eye-surface reflections. It also makes the pupil appear white, and it “flattens” the appearance of the lids by reducing tonal contrast. To avoid using flash, bring the horse outdoors if possible and adjust your camera settings if required. You may need to use a higher ISO setting and shallower depth of field (lower F-stop number) to get the effect that you want. Simplify the reflection in your drawing to some extent. If sky is behind me, I often see a horizontal band of highlight curved over the upper part of the eye. Look closely and mark the shape and position of the main highlight in to start with. You can always add more detail later. Any highlight or reflection will extend smoothly over the eye surface (over the black pupil, brown iris and white sclera). It does not stop suddenly at the edge of the pupil or at the edge of the iris. The highlight makes the pupil, iris and sclera lighter in tone. It is easy to appreciate a bright highlight over the dark pupil and iris. But the highlight can extend over the sclera, the “white of the eye” too. Most of the sclera is actually off-white (slight bluish or yellowish grey) and a bright highlight extending over it will be lighter in tone than the rest. Don’t get too worried about the exact colour of highlights, but do notice whether the highlights are “warm” (yellowish) or “cool” (bluish) in colour. Make good sketchbook notes with the horse in front of you, as you will not get that information reliably from a photo. How bright (light in tone) are the highlights? Again, do make good sketchbook notes. Some of the reflections on the eye surface are dark shapes. You may see yourself reflected (!) or the dark shape of a building behind you. Decide how much or little of this detail to include. It is your choice. Below is a photo that I have taken of Moonie the pony. 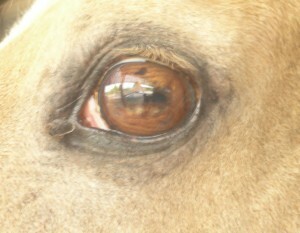 If you look closely, you can see me, my camera and much of the stable yard reflected in the eye surface. Eyelashes emerge from the upper, not lower, eyelid. Think of the whole set of lashes as one structure to start with. Look back at the eye photos in this article, and notice how they emerge from around the upper edge of the upper eyelid. There is a little gap between the surface of the eye and the point where the eyelashes emerge. 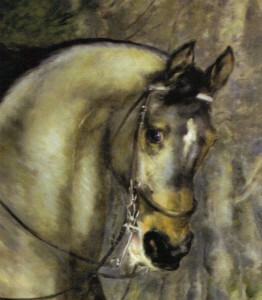 If working towards a horse portrait, do take careful note of the colour, length and general direction of the lashes. The eyelashes are often lighter in tone than the eye itself. That means that they need to be planned for if working in a translucent medium from light to dark, e.g. watercolour. Don’t just put them in as an after-thought. 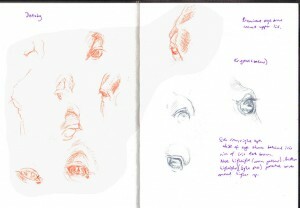 Do step back now and again and make sketches of the whole head and neck, indicating the general shape of the eye without any detail. The size of the eye compared with the head, and the distance between eye and mouth, are important in achieving a “likeness”. Drawing horse eyes from life is a big challenge. If you are working towards an equine portrait, spend a couple of hours sketching the head from several angles and from near and far, draw features close-up and make notes that you yourself understand about colours, etc. By all means do take flash-free photos to supplement your sketches, but don’t rely rigidly on any one photo. Dear Bevan, Thanks for your kind words. You know how you can sometimes recognise a particular horse (or person) from halfway across a field? Sometimes, to get a good likeness, the whole shape and posture of the head and neck are more important than the detail in the eyes. Things to look for in your low-resolution photo include the shape of the ears (how long are they, and how are they positioned?) the angle of the head compared with the neck and, if the photo is clear enough, some of the bolder shadows and ridges around the eyes. If all else fails, then you’ll have to go and meet the horse (in secret!) and take your own photos. Good luck!